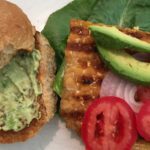 If you haven’t yet discovered tempeh, you’re in for a great find. While tofu offers incredible protein, tempeh is the entire bean with protein, fiber, antioxidants and more. For a killer sandwich, grill some tempeh for a few minutes in liquid aminos and sesame oil, toast a sprouted grain bun, add a little avocado tahini spread and some veggies. Truly Satisfying! Mix aminos and sesame oil. Slice tempeh into 1/4" thick slices. Dip tempeh into mixture. Grill tempeh on both sides in pan on stove or on George Foreman or other type grill, until golden brown. In separate bowl, with fork, mash one slice avocado into 1 tablespoon tahini. Spread onto toasted bun. Top with lettuce, tomato, red onion and any other favorites. Enjoy!